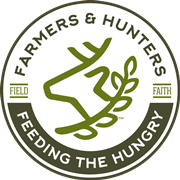 HunterInfo - Farmers and Hunters Feeding the Hungry - Hunt Down Hunger! You can donate a deer to help feed the hungry of your community this season! ​CLICK HERE for help finding participating butchers and programs that can transform your donation into meat for those in need. For state by state information about hunting licenses and permits, season dates, where to hunt, hunter education classes, laws, regulations and more CLICK HERE. ​YOU CAN HELP US MAKE A DIFFERENCE TODAY! People across America struggle with food insecurity and are often desperate for meat and protein items. We pay local butcher shops to process deer that are donated by generous hunters like you and give the meat to feeding programs and ministries that help those in need.